This one is a quick one but it is definitely worth the short notice! Are you looking for ways to support charities based in St. Louis? Well, here is your chance. 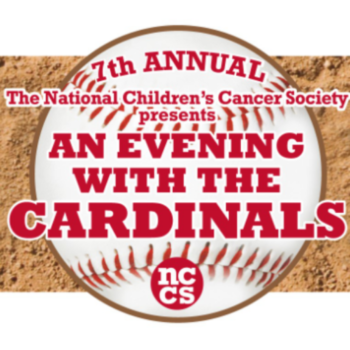 The National Children’s Cancer Society (NCCS) will host its 7th annual An Evening with the Cardinals event on Saturday, January 26 at the St. Louis Union Station Hotel. This special event is a dinner and program focused on raising awareness for the NCCS’ work supporting families facing the reality of childhood cancer. This year’s featured guests include Cardinals Hall of Famers Jim Edmonds and Chris Carpenter, along with emcee and voice of the Cardinals, Dan McLaughlin. You can join these esteemed players as they talk, laugh and reminisce about their careers with the Cardinals. In the past six years, the event has raised more than $1.3 million for families battling childhood cancer. You can see highlights from last year’s event here. Tickets are on sale NOW, so be sure to grab them while you can. If you can’t make it to the event but still would like to help out in some way, you can always send in a donation! Donations will help the NCCS continue supporting families like Rhyan’s. Soon after Rhyan started kindergarten, her parents noticed she had developed a small limp. And, this typically upbeat little girl was suddenly very moody. 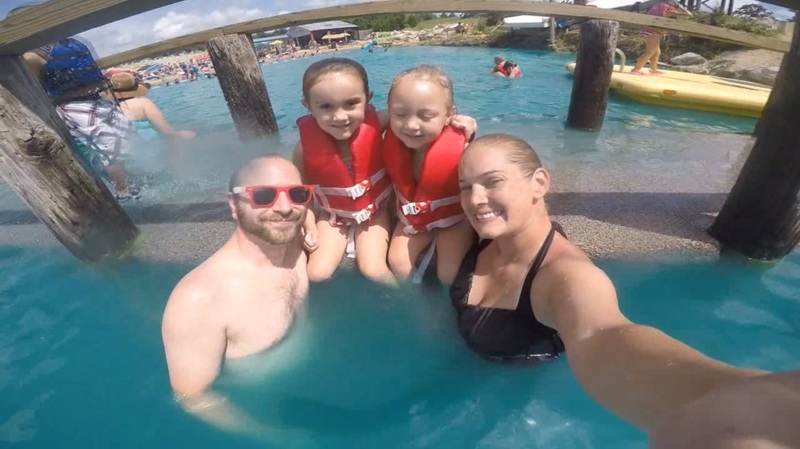 After several tests, Rhyan was diagnosed with stage IV neuroblastoma. 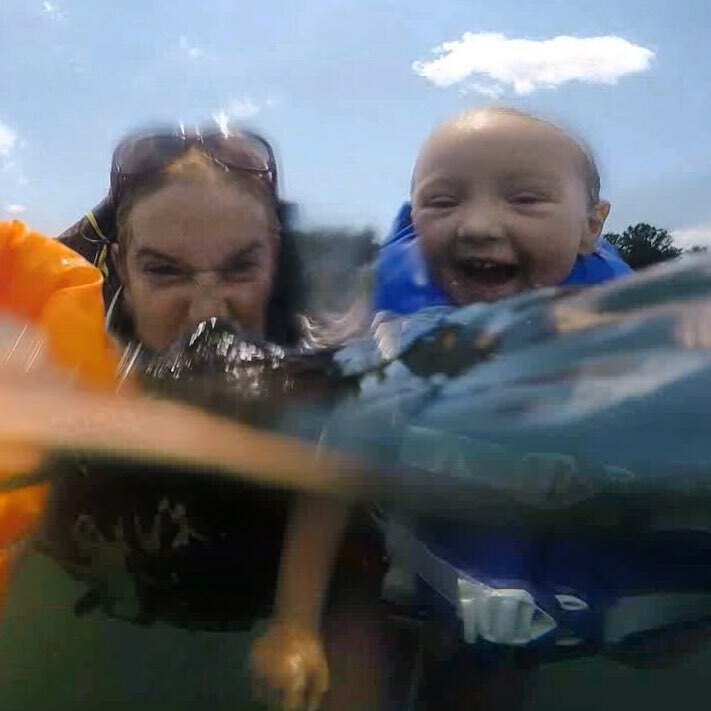 After local treatment in Missouri, Rhyan needed her care transferred to a premier treatment facility in New York. The NCCS began assisting Rhyan’s family in June 2017 and has since funded 36 roundtrip flights and 18 cab rides, and will continue supporting Rhyan to ensure that she gets the best treatment possible – no matter what. Now, Rhyan is 8 years old, in third grade and is her “loving, bubbly, sassy self,” says her mom, Jen. About The National Children’s Cancer Society (NCCS): The National Children’s Cancer Society (NCCS), headquartered in St. Louis, Missouri, is a not-for-profit organization providing support to families making their way through the daunting world of childhood cancer and survivorship. With over 30 years of experience serving more than 43,000 children, the NCCS is able to take a “no matter what” approach to help families stay strong, stay positive and stay together. The NCCS has been recognized as a Better Business Bureau Accredited Charity and earned a GuideStar Platinum Seal of Transparency. For more information call 314-241-1600, visit theNCCS.org, or on Facebook and Twitter. I personally did not hear it and I haven’t heard any recordings of it, but that didn’t stop the people from claiming that the best fans in baseball are bigots. 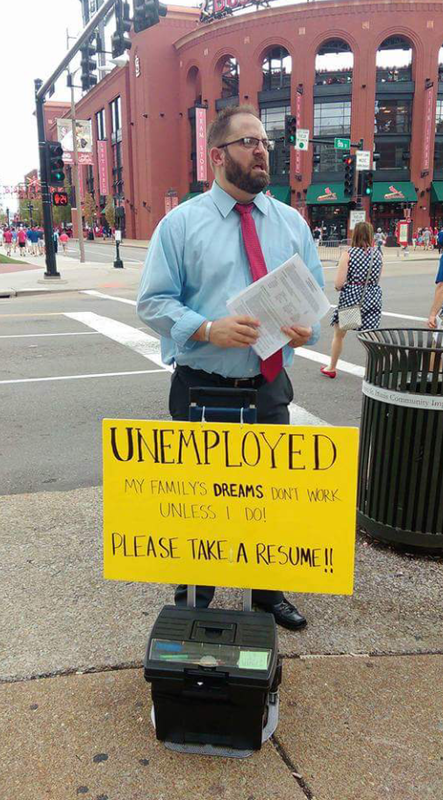 Many are claiming that the Cardinals fans would never do such a thing, which I would like to believe. Maybe it didn’t even happen. According to Deadspin it didn’t… But according to the New York Daily News it did. I didn’t hear it myself but to claim that it did when it didn’t, well that’s something right there. I do believe there can be racists anywhere, including in Cardinal Nation. However, I do think we are better than this and if it did happen or didn’t happen is irrelevant as the idea of being unsportsmanlike is bad for the birds and bad for baseball in general. The league is so diverse as it is. What would shouting something like that out at a game do to help anybody? I didn’t want to have to write this. I already wrote about sportsmanship last July when Yadi was boo’ed at the All-Star game in Cincinnati. I didn’t want to have to write the same thing again about the fans. We need to be better than this and I think we can and are better than what the headlines read. On Sunday, the Cards played the Cubs in their first match up of the season. 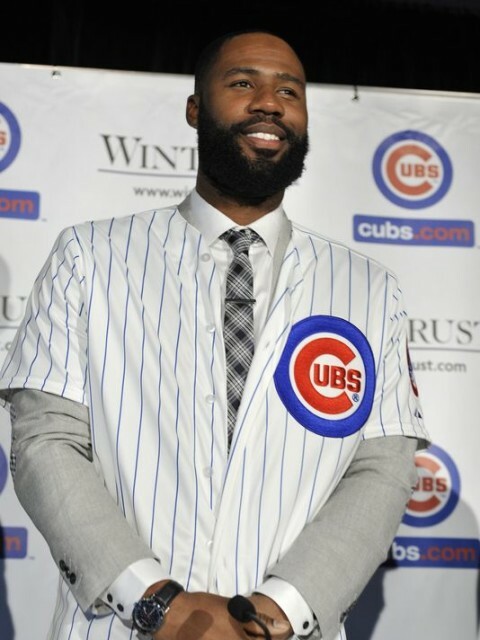 In case you were not aware a stand out player from last season Jason Heyward went from playing for the Cardinals to the Cubs and apparently some Cards fans were not too pleased to see Heyward out on the field. 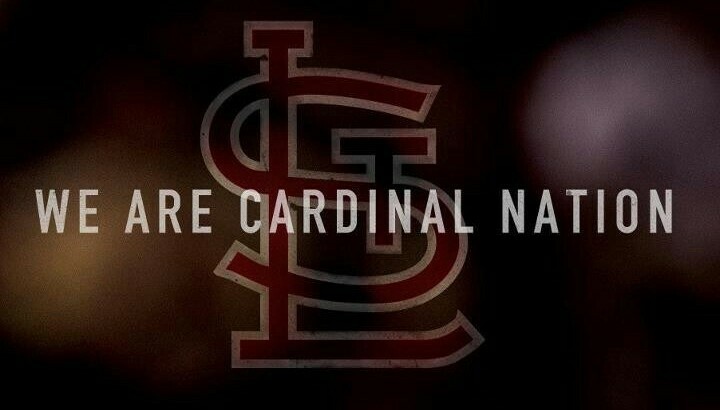 During the footage you can hear Redbirds fans booing Heyward. Which is okay during the regular and post season. But according to some sources instead of just booing him like many fans did, they threw out racist language that apparently was caught on ESPN’s mics. I have heard some claim that ESPN has said no slurs were said but I haven’t seen an actual source saying this. So my guess is as good as yours. What I do know is that Jason Heyward is an amazing ball player and he deserves at least that much respect. Boo him if you’re upset he’s not a bird anymore but to call him something completely inappropriate is uncalled for. 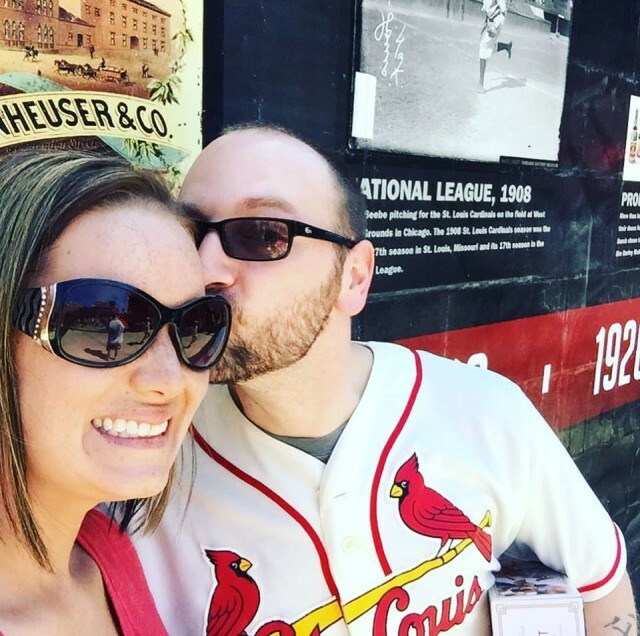 Busch Stadium is a family friendly stadium and hearing claims of this makes me sick and sad to be a Cardinals fan. 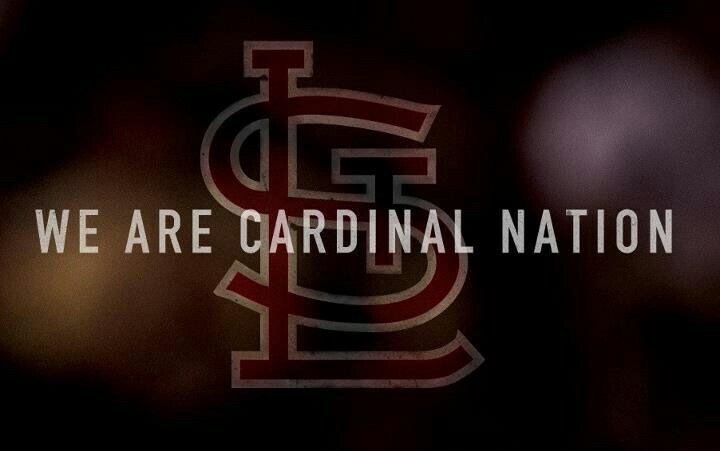 This isn’t how Redbird Nation became the best fans in baseball. I think we’re better than this and I am having a hard time believing it actually happened. I will also say that if I was sitting next to someone yelling out that racist language, best believe I’d say something to that person. Nobody deserves to have racist slurs directed at them. Date Night? How About Date Day! Date night, the night where everything comes together and stress melts away while you eat, dance, drink, and maybe eat some more. 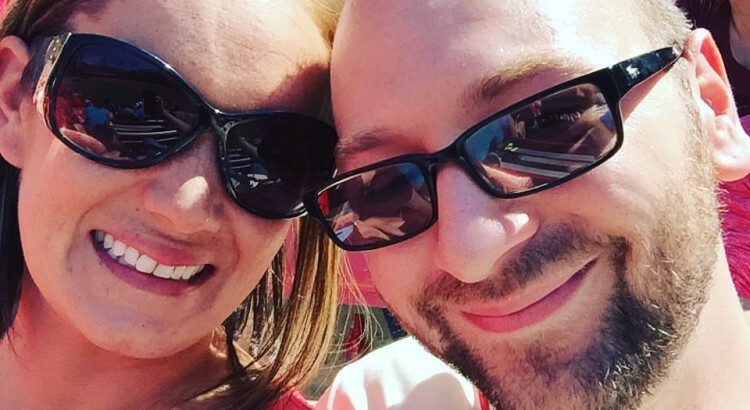 But what about those times where you just can’t get a date night… Well how about a date day? 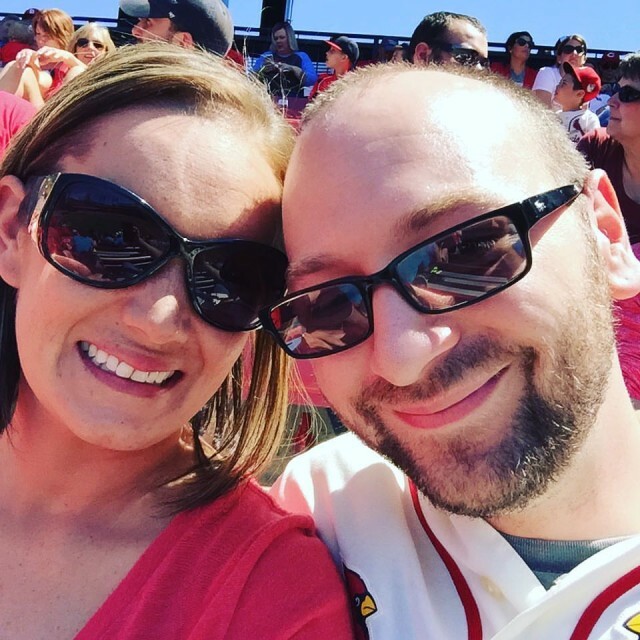 This past weekend my wife and I had two tickets to a St. Louis Cardinals game. We always try to go at least once to a game, so we called up mammaw and pawpaw and asked them to watch the kids while we went to the game. It was one of the best days ever. This isn’t a joke either. We didn’t drink any beer or alcohol, but we did enjoy some tasty nachos, shared a burger, and a few sodas. The Cards started off great with a homer and a few runs, but the Reds quickly caught back up and took the lead. That’s okay though. It’s not always about winning at the ball park (unless it’s October, then it’s all about winning). We joked and laughed and talked and kissed under the nice big score board in the outfield bleachers. It was a fantastic day that I wish didn’t end. I also wish we had even more money than what we took because it would’ve been cool to try out even more food than what we already stuffed in our faces. It was one of the best days ever. We snuck around trying to find other seats, which just happens to be one of my favorite things to do. We didn’t get very far because just about every section has someone there wanting to check out your ticket. We made it to a few standing areas but we didn’t get as close as we wanted. However, we did take advantages of a nice little sale near one of the stores and picked up a $10 hat. I have been to many baseball games as well as a few giveaway games where they give away something, but never got anything. They ran out of Mother’s Day bats when we went on that day and seen dads and kids with the bats (hey you’re not a mom!). This time we were fortunate enough to get to the stadium early enough to get two Adam Wainwright bobble-heads. How cool is that? Pretty cool except you now have to carry these two boxes around with you most of the day. But that’s okay. It was well worth it. After the game we got back on the crowded metro-link and headed to our station to get home. Once we got home we took off our shoes and relaxed our socks as we planned our dinner and the rest of our night. We settled on making a delicious homemade dinner and visiting Donkey Kong Country on the SNES. Sometimes, it’s not a date night, it’s a date day, and to me, that is completely okay. Especially when you’re with the woman you love. What he wrote may ring true for many out there looking for work. Dreams can sometimes only be filled when there is some semblance of financial stability. Without proper finances dreams are put on hold. Which can be very heartbreaking for a family. 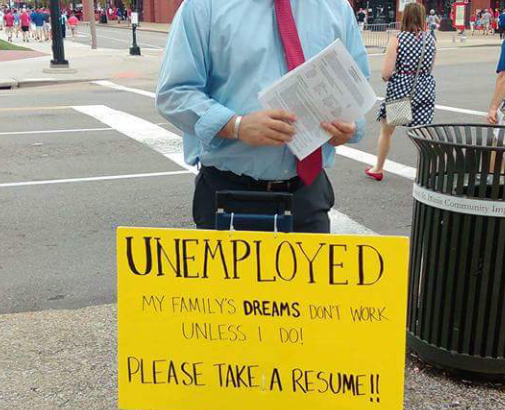 Donnie’s ethic in job searching has since went viral with the image posted to Facebook, Imgur, and Reddit with comments on some of the sites ranging in the thousands. A few TV news stations have also picked up on Donnie’s story. Seeing that Donnie was from St. Louis and a member of a parenting group I am also in I had to send Donnie a quick message offering support from another St. Louis Dad. Are you looking for someone who is hard working and willing to go the extra mile? Donnie might be your guy. Check out his info below!